Debby Klein has been a part of the scenery around Mary Washington and the Fredericksburg-area community for more than 50 years. Recently, she notified the Mary Washington Foundation that she has included the University in her estate plans. Now a member of the Heritage Society, she says she is happy to help support students, especially those with an interest in theatre arts. Debby and her late husband, Albert R. Klein, first arrived on campus in 1952 when he was hired as an instructor in dramatic arts. Dr. Klein led the theater through many innovative and creative changes and became head of the then Department of Dramatic Arts and Speech. In 1970, Dr. Klein suffered a heart attack and died. To honor his memory, the Albert R. Klein Memorial Scholarship was established for drama majors, and in 1971 the theatre in duPont Hall was named the "Albert Roger Klein Memorial Theatre." 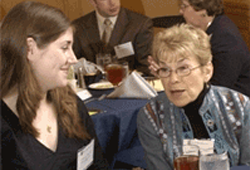 During the past 35 years, Debby has met many of the Klein scholarship recipients. "I am also a recipient," she says, "I am a recipient of the respect, esteem and love bestowed upon my husband by Mary Washington in establishing the scholarship and of the appreciation of the students who receive the scholarship each year." Debby loves to talk about scholarships, education and the arts. "I am glad I have the opportunity to help perpetuate the growth of scholarships at Mary Washington through my estate plans, and I certainly appreciate being acknowledged as a member of the Heritage Society."